It’s easier and cheaper to get an education loan today than it was five years ago. This is largely because of the increased push by the central government to popularise such loans and greater competition among lenders following the entry of NBFCs into this space. 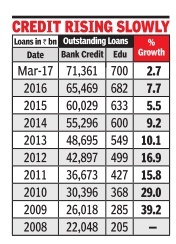 Though better education loan availability is a plus, experts say borrowers need to carry out ‘due diligence’ that they would do before taking any other loan. The following steps need to be considered. Several private institutes have education loan desks of banks on their premises. When deciding on the institute and course you want to pursue, don’t be lured by the easy availability of education loans. “The decision should be independent of whether it is financed by a loan or not. The institute and course must be right for you and the decision should be based on what you want to do in future,” says Adhil Shetty, CEO, Bankbazaar. Once you have identified the course, determine the loan amount needed. In addition to tuition fees, you need to consider other expenses like hostel charges, mess expenses, other incidental expenses, etc. From this total cost, deduct the amount your parents are pitching in with. The figure that you are left with will be the loan amount you need. Make sure that the course you are doing will help you repay the loan. “Just as banks assess a borrower’s earning capacity based on the institute and course, borrowers also need to see whether they will be able to repay the loan based on the job prospects of that course,” says Ranjit Punja, CEO, CreditMantri. Historical placement details and the salary offered can act as indicators. Consider the ‘average salary’ and not the top salary offered to a handful. “Make sure your EMI is not more than 30% of the prospective take home salary,” says Punja. You need to hunt for the lowest rates. Make full use of the Vidyalakshmi portal (www.vidyalakshmi.co.in), managed by NSDL, that gives the details of all banks offering education loans at once place. Banks usually give loans at lower rates for premier institutions like IIMs and IITs. For instance, Indian Bank offers loans at an interest of 9.95% for students headed for IITs, IIMs and IISc. It charges 10.45% for students at NITs and 11.75% for other students. For private institutes, banks usually distinguish between students who get admission through the government quota and through the management quota. Though cheaper than personal loans, education loans are more expensive than home loans. “An education loan is costlier because it is an unsecured loan, while the home loan is secured,” explains Punja. When the loan amount is high, banks usually ask for a guarantor, which in most cases is the guardian. Leveraging on the guardian’s credit worthiness or offering some collateral are the ways to bring down the cost of education loans. Most banks give loans for up to 10 years and extend this tenure to 15 years for big ticket loans—₹7.5 lakh or more. So what should be the ideal tenure? There is no fixed answer. While the EMI is less for long duration loans, the total interest payout is much higher. “One advantage of taking long duration loan is that you can bring the EMI under the suggested 30% cut off.” says Punja. You should not worry about the high interest payout either. You have the option of prepaying the loan. However, as interest on education loan is tax deductible under Section 80E for up to eight years, it is better to prepay long duration loans within eight years. “Treat this like the prepayment of other loans with tax benefits. If there are better investment opportunities that offer better return than the tax adjusted cost of education loan, don’t repay; else repay,” advises Punja. 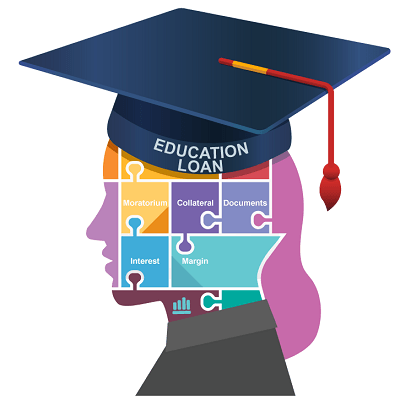 One unique feature of education loans is the moratorium period. The borrower has the option not to pay the EMI for up to 12 months after course ends or six months after he starts working, whichever is earlier. Keep in mind though that this moratorium is not an interest-free period. The interest keeps accruing for the period you are not paying EMIs. “It’s advisable to start repaying EMIs as soon as possible to reduce the interest burden,” says Shetty. Since an education loan is usually the first loan one takes, one can also earn a good credit score by paying it back on time.